By Amanda While it doesn’t happen often, every once in a while I have a potential client/friend/stranger that says, “Why Stay on Site…it’s SO much cheaper to stay off-site!” While years ago it was simply a matter of money and proximity, today it’s not quite so simple. 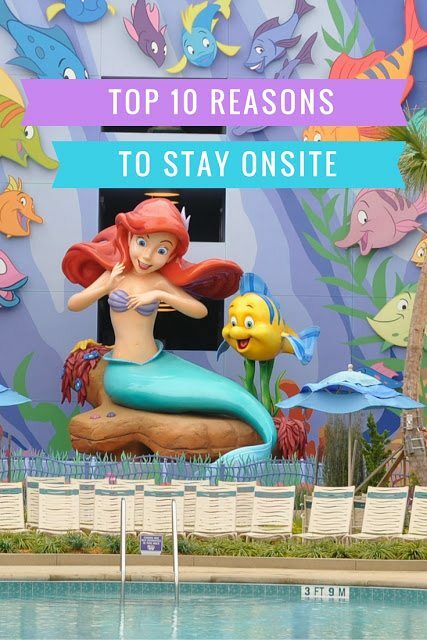 Today I’ll share the top 10 reasons to stay on Disney property! Disney Dining PlansI’m a HUGE fan of the Disney Dining Plan. Most of my clients purchase the Quick Service or Plus Dining Plan. Not only can these plans save you 20-30% off the regular cost of food. Even if you didn’t save that much…or simply break even, my family loves the convenience of these plans. We don’t have to budget ahead and guess how much we spend, we don’t have to order something cheaper on the menu….we simply order what we are in the mood for and have the credit deducted from our plan!